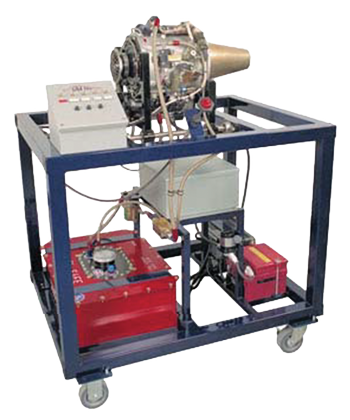 The Model AE-11 Turbine Engine Training System is a functional,scaled down turbine engine ideally suited for training applications.The engine is a small compact free turbine engine manufactured by Honeywell/Allied Signal Inc. Elaborate safety features built in this engine test stand make it one of the safest designs on the market for education and testing roles. It comprises a gas generator and an accessory drive assembly. The gas generator incorporates a centrifugal compressor, an axial flow turbine rotating unit and an ignition and combustion system. The accessory drive assembly incorporates a lubrication pump, a fuel pump, a 50% cut-out switch, a generator and an electric start motor The engine has been modified from its original purposes as a gas turbine engine starter by removing the power recovery turbine and gear reduction unit and replacing with a custom fabricated exhaust nozzle to allow for continuous operation while not under load. The fuel control unit has been modified to allow for control of engine rpm by a Vernier throttle control.